Recently, I came across an interesting blog called Letters of Note. The premise of the blog is simple–each post is a letter deemed worthy of a larger audience than just the initial recipient. I found the blog through a tweet mentioning a post with a letter written by Charles Bukowski on censorship. Naturally, I couldn’t resist as I like all things Charles Bukowski. I nosed through more of the letters and became instantly entranced with what I found. There’s a letter from survivors of the Titanic, a letter from a World War II Japanese suicide bomber to his children, and a letter from Conan O’Brien, respectfully turning down an invitation to the prom from one of his fans. I have always been a sucker for letters. There is something so personal about someone expressing their thoughts to you in writing. If it weren’t for the advent of email, I’d still be writing letters. I spent a large portion of my childhood writing and receiving letters from various pen pals around the country. Summer afternoons, I’d stake out a spot in the living room and wait in great anticipation for the mailman. A good day meant receiving three letters at a time, a bad day meant no letters. I’d pretend not to be disappointed, but really I yearned to tear open envelopes and gush over juicy letters. Although email and AOL instant messenger ended my serious letter writing days, I did keep all of the letters that I received. I could never bring myself to throw anything away that was handwritten. Letters were sacred texts. How nice of you to write and say that you liked The People of Pineapple Place enough to get a friend to read it too. Authors are happy to get letters like yours, because it proves that here are readers out there. Sometimes we wonder! If you think about it, writing is kind of a puzzle: we do it in order to communicate with our readers, but the harder we work, the more we shut ourselves away from them. Your Battle of the Books sounds like fun. I bet you discovered some good stories that way! I’m not at school anymore, but I have an ongoing, friendly battle of books with my cousin Faith to see who can list the most good “rereads” for the other. Lots of Faith’s favorites are out of print so I have to hunt them down in libraries or even used book stores. The used books often cost only a dollar or two, so I usually buy them and now have quite a collection. You should keep a list of your own favorites so that if you want to reread them in the future, you’ll remember the titles and authors. As an aspiring writer, I was especially pleased to get such a personal response from my favorite author. In the years after I had received her letter, I often thought about what she had said about how we write to communicate with our readers but the solitary act of writing shuts us away from them. I even contemplated writing to her as an adult, but sadly I found out that Anne Lindbergh died of cancer ten months after I had received her letter. I’ll always remember the excitement I felt from receiving such a letter and for that reason, I will always hold on to it. 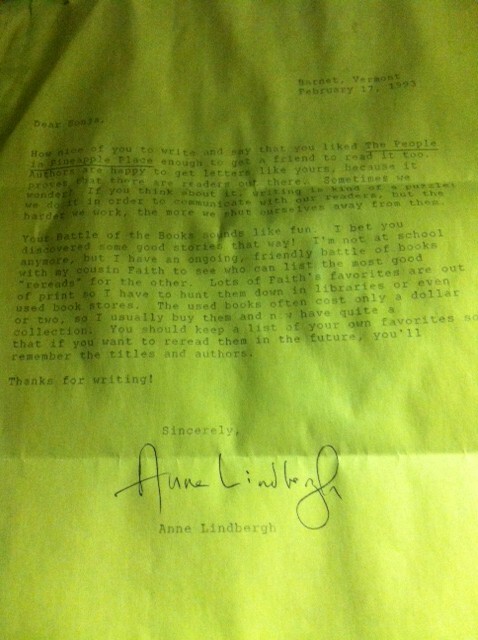 Letter from Anne Lindbergh. February 17th, 1993.